Freedom of expression is heavily curtailed in Zimbabwe under Mugabe’s government. Henry Makiwa dissects the difficulties that face its journalists in delivering accurate reports. The Zimbabwean crisis has undoubtedly been one of the longest-running news stories of the past decade. But the difficulties faced by journalists trying to report from Zimbabwe has led to the situation being either understated or exaggerated. As a Zimbabwean living in the UK and a journalist myself, I have struggled to get an accurate picture of the ever-changing scenario in my country. In the past six years the Zimbabwean government has promulgated draconian laws that shackle the country’s media. The same laws have also outlawed foreign media and caused Zimbabwe to become isolated from the rest of the world. Chief among this legislation is the Access to Information and Protection of Privacy Act (AIPPA), which was used to ban two of the country’s most popular newspapers – the Daily News and the Daily News on Sunday – in September 2003, followed by The Tribune newspaper in June 2004. The list of affected media has grown longer as independent radio and television stations have been targeted. All were highly critical of President Robert Mugabe’s regime. If AIPPA left any loopholes, they were closed by the equally repressive, and hard-to-understand, Public Order and Security Act (POSA), which deals with the publication, or communication of statements deemed “prejudicial” to the State. The law imposes a prison term of up to 20 years in the event of a conviction. Observers and legal experts generally agree that these laws have hampered the full participation of citizens in the country’s political processes and seriously affected freedom of association, equal opportunities to access the media and above all, political tolerance. Only two major privately-owned newspapers have survived the government’s onslaught, namely, the Zimbabwe Independent and The Standard. The papers are constantly threatened by the ruling Zanu PF party which accuses them of being sponsored by so-called imperialist forces and of writing stories “meant to reverse” Zimbabwe’s independence. In addition, many of the country’s most enterprising journalists have been assaulted, jailed or tortured on many occasions. Most foreign correspondents have been hounded out of the country – arrested, deported or denied accreditation to work in Zimbabwe. Meanwhile the government maintains a tight grip on the state media, which it has used for propaganda and, in many instances, propagation of hate messages. Indeed, the unrelenting propaganda faced by Zimbabwe’s citizens, most of whom do not have access to alternative media sources, has resulted in a society that is fearful, misinformed and losing interest in participating in national issues. But it is encouraging to see that Zimbabwe’s independent media have not surrendered to government pressure. Instead, journalists inside and outside Zimbabwe have found ways of bypassing the restrictive laws through the use of new media. A number of online publications have come onstream, including newzimbabwe.com, zwnews.com, zimdaily.com and blaztv.com, filling the void created by the closure of the mainstream newspapers and terrestrial broadcasting media. 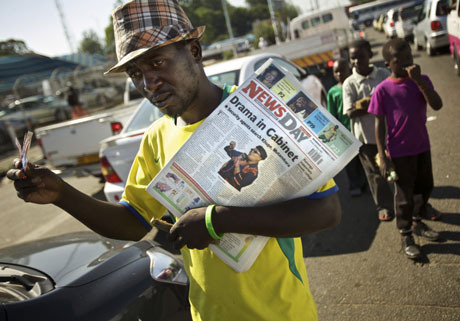 Zimbabwe can now boast a thriving internet news media while several blogs and websites devoted to reporting the country’s politics have been established. News agencies such as the BBC, Sky and CNN have made use of journalists in Zimbabwe to report for them, the journalists using an alias in an attempt to sidestep measures laid down by the government. The downside of this has been that ethics are often thrown out of the window, as these journalists are not likely to be held to account for their reports by the public, while verification of their stories is near-impossible. As I write there is a glimmer of hope that things may brighten if Mugabe finally bows out of power. The opposition seems headed for a historic victory following the March elections. Hopes are high among Zimbabweans that a new administration will relax the media space and conform to the principles and guidelines of universal statutes of freedom of expression.